I'm an experienced long time, unsuccessful trader looking for profitability and consistency (aren't we all), anyway you seem to have way TOO much information. Can your method be boiled down to a few simple rules or is it more complicated than that. Sorry to be so blunt. Thanks. Thanks for your email. The short answer is no! My methods cannot be boiled down to a few simple rules. It's a good question though so I'll expand upon this answer in Friday's newsletter, looking at a trade sequence from today's HSI market. That will give you greater awareness of how I trade. And also why I don't believe that market success can be boiled down to a few simple rules. 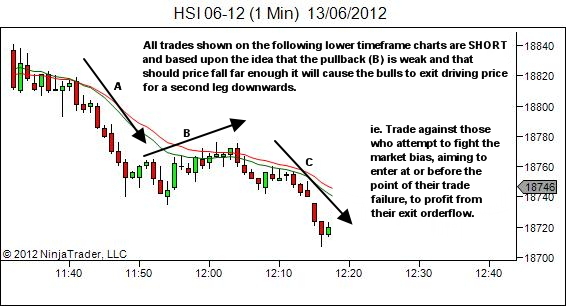 Trade against those who attempt to fight the market bias, aiming to enter at or before the point of their trade failure, to profit from their exit orderflow. Improve your ability to do step 1, over time, through application of deliberate practice methods of learning. Simple rules… but not easy to implement as they require a process of skill development! I imagine though that this is not the answer you're after. I am assuming that you're actually seeking a mechanical system. If I've misunderstood then I do apologise, but your question will still act nicely to represent those MANY email requests I do get for simple mechanical trading systems! 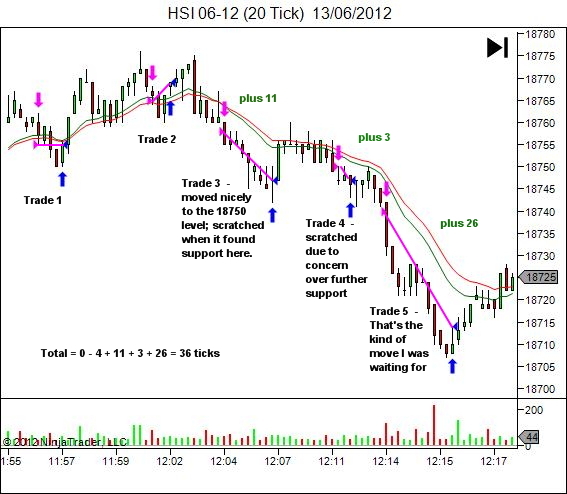 Let's look at a sequence of trades from today's charts which demonstrate the first of my two-part rules. 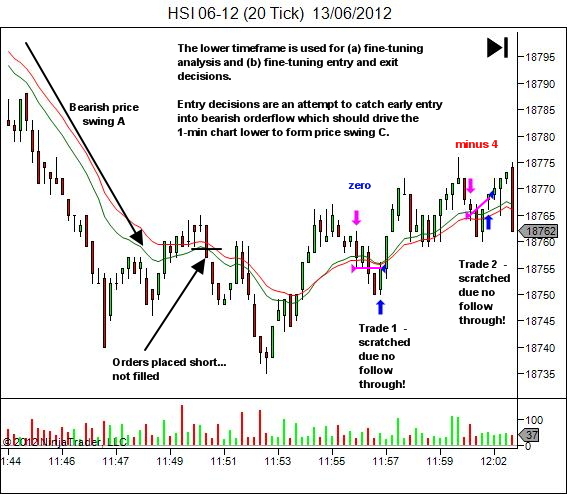 I can show you example after example where the initial entry trigger leads to a smooth and rapid move towards the target. They make for great sales page images. But today's trade sequence shows another side of the markets. The price movement is all too often messy. Essentially this sequence shows several entries in an attempt to position short, during what turned out to be a quite extended and complex pullback. This is the way I prefer to manage risk; in and out with tight risk control. It's not the only way. Others may prefer a single entry and wider stop, aiming to hold through whatever chop comes their way but risking greater loss than I in the event that our bias assessment is wrong or the market conditions change. They may well have done fine during the above sequence as well, perhaps with an initial entry, a full stop out, and a re-entry for net profit overall. The point though is that price action is often messy. Rarely will you get perfect textbook examples. So you need to learn to operate in this environment of uncertainty, doubt and second-guessing. No matter the rules you apply, whether price action based, or indicator based, the markets will move often enough outside your rules and parameters to frustrate you. Pullbacks will extend further than you expect, giving a number of false starts before making the final move. Overbought or oversold markets will extend further than your rules say to expect. Your decisions, your actions and your results will almost always be sub-optimal when viewed with the benefit of hindsight. Markets change. Fixed rules cannot work. Future price movement is a result of future orderflow; and that is the result of the net sentiment of all traders participating in the market. Human action cannot be subject to fixed quantitative rules. Discretion must be involved. The fact is you're not really trading against the market. You're trading against all the other traders in the market; in a game in which a small group consistently get to take money from a much larger losing group. If you want to join the ranks of the consistently successful, you need to be able to see the true nature of this game. It's not quantitative. It's not even about technical analysis. It's about people making decisions. It's about keeping one step ahead of the masses, learning to assess their likely actions and reactions and positioning yourself to profit from them. Hence the need for the second of my two-part rules; "Improve your ability to do step 1, over time, through application of deliberate practice methods of learning." Simple rules cannot help you accept the risk of an open position when faced with an uncertain market and unexpected price movement after your entry. Should you hold or fold? This only comes with experience; and through truly understanding at the core level that the markets cannot hurt you, because you've been to hell and back already and survived. Do I have "TOO much information"? I don't believe so, but I can see how you could perceive it that way. In reality, everything I've written is an attempt to get people to break through the idea that trading can be about simple rules, and to see that it's in fact a different game entirely. If there is a lot of repetition it's because this breakthrough is not easy to achieve. At some point though an unsuccessful trader MUST stop their search for a set of simple rules, accepting that the reason they remain unsuccessful is NOT because they haven't yet found the simple rules, but rather because THE SIMPLE RULES DON'T EXIST. I've been there! We all have! I aim to help others with that transition. You admitted that you've been trading unsuccessfully for a long time. What is it going to take for you to realise that your approach to mastering this game is flawed? The way I see it, you have three options! Continue on your pointless search for a simple rule based approach to trading. Actually learn to trade for a change. Ultimately it comes down to whether or not you really want to be a trader. Or perhaps your true needs are being satisfied by the search, which allows you to keep busy and feel productive without ever having to face the uncomfortable uncertainty that is the reality of the trading game? PPS. Seriously though… if simple rules worked then why are the systems forums not filled with successful traders? Presumably this is an old post now but it is definitely one of the best posts I have ever seen about trading and what it takes to be successful. Great article I enjoyed reading it for the 2nd time. While looking at the chart examples I came across a question though a bit unrelated but it’s a great example so forgive me. Am I correctly seeing a spring turned up thrust trap on trade 4? Yes, but it’s the completely wrong location to be searching for entry long. The bias is short. This is a common error – go searching for trigger patterns and you’ll see them all over the place, but most will be lower probability. Instead look to context first – S/R structure, trend structure – and project the trend forward as discussed in the YTC Price Action Trader volume 2. This will provide the trade locations. Only then do we look for trigger patterns. Hi Lance, I have been through many of your old posts. . its one of the most psychologically motivating blog. You have indeed reviled the holy grail !